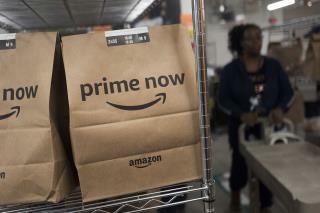 (Newser) – Amazon is raising its minimum wage for all employees to $15, a bump that could have implications throughout the US workforce. The raise, effective at the start of next month, will cover 250,000 workers and 100,000 seasonal employees, reports the Wall Street Journal. The company has been under fire from critics—notably Bernie Sanders—for making a fortune while paying its warehouse workers so little that they often need federal assistance, notes CNN. Amazon says it will also lobby to have the federal minimum wage increased from its current $7.25 per hour. WOW! Beboz must have got a spanking from uncle Bibi. Ease up on the goyim and all that. Looks like they get to eat once in a while. Maybe good old Jeff will move the bathrooms in closer so the workers won't have to use the aisle trash cans. The simple financial truth is that not many companies except Trillion dollar market cap ones like Amazon and Apple could afford to pay this wage. But only non-business people ignore that fact. Thank you Bernie, They wouldn't have bothered without the negative publicity.